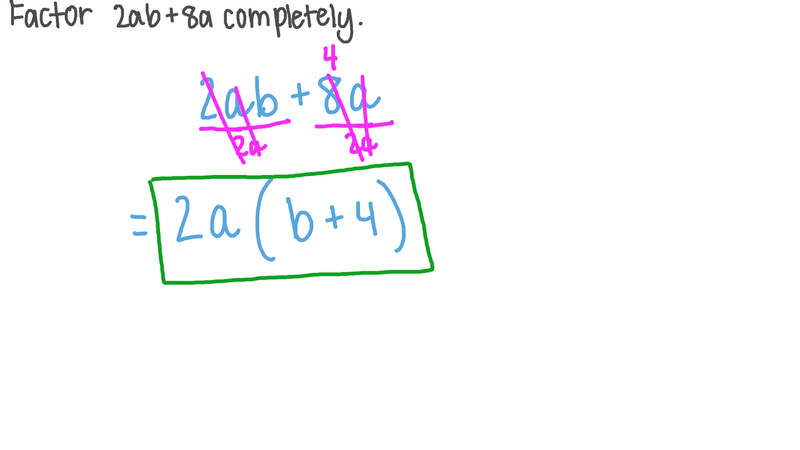 In this lesson, we will learn how to factor algebraic expressions by identifying the highest common factor (HCF). Write 3 5 𝑥 + 9 1 0 in the form 3 1 0 ( 𝑎 𝑥 + 𝑏 ) . Factor 6 𝑥 + 2 4 . Factor − 2 0 − 1 5 𝑥 . Factor the expression 3 𝑝 𝑞 + 𝑝 completely. Factor 2 𝑎 𝑏 + 8 𝑎 completely. 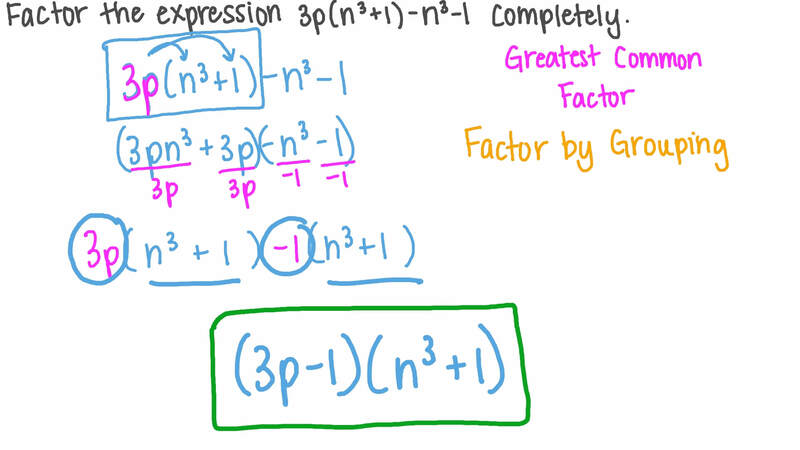 Factor the expression 3 𝑝  𝑛 + 1  − 𝑛 − 1 3 3 completely. Factor the expression 6 𝑝 + 3 𝑝 − 6 𝑝 𝑞 2 completely. Write 2 3 𝑥 + 1 6 in the form 1 6 ( 𝑎 𝑥 + 𝑏 ) . Factor 1 5 𝑒 + 1 5 𝑓 completely. Factor 8 𝑥 + 4 0 𝑦 completely. Factor 𝑥 + 3 6 𝑥 3 completely. Factor the expression 4 𝑏 𝑐 + 2 𝑏 𝑑 completely. Factor the expression 2 ( 𝑝 − 1 ) + 𝑥 ( 𝑝 − 1 ) completely. Expand − 3 𝑥 ( 4 𝑦 − 7 𝑥 ) . Expand 4 7  3 4 + 8 9 𝑥  . Which of the following expressions is equivalent to 2 ( 4 𝑥 − 2 ) ? Expand − 7 ( 8 − 1 2 𝑥 ) . Which of the following expressions is equivalent to 4 ( 3 𝑥 + 2 ) ? Which of the following expressions is equivalent to − 1 1 ( 3 + 1 2 𝑥 ) ? Which of the following expressions is equivalent to − 9 ( 5 − 6 𝑥 ) ? Expand 1 0 ( 3 + 5 𝑏 ) . Expand 4 ( 3 + 9 𝑥 ) . 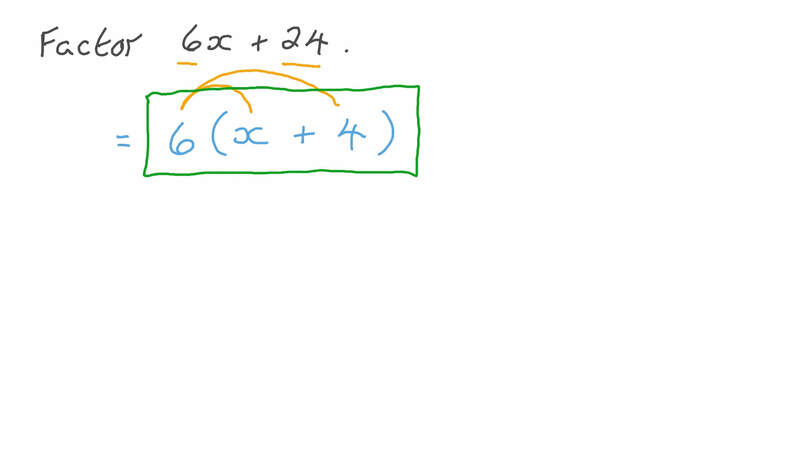 Expand − 1 1 ( 5 + 7 𝑥 ) . Expand 2 3  4 5 𝑥 − 3 1 0  . Expand 1 2 ( 3 𝑥 + 8 ) .